I carefully tucked the leaves into my pocket before boarding our train to Aguas Calientes. Frank was going to await our return to the Sacred Valley, the next evening. 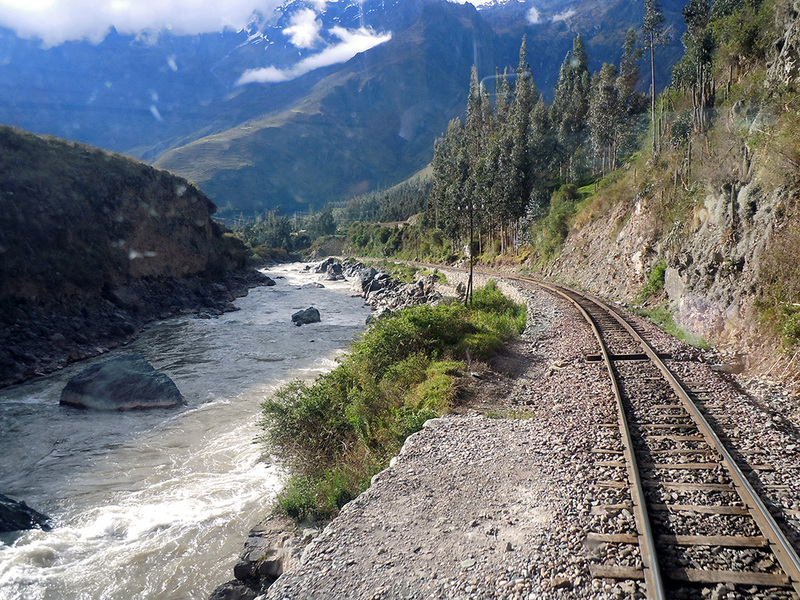 We lucked out with front row seats to the spectacle of nature unfolding outside the plate glass windows of our Vistadome train from Ollantaytambo to Aguas Calientes. The latter turned out to be a huge let down, but our hotel was on the edge of town and our corner room, overlooking the roaring Urubamba river, gorgeous. The hotel was a splurge after our humble home-stays and apartments across the continent. But the package, although pricey, came with noteworthy extras: a special dinner, entrance tickets, a three hour guided visit, evening tea and cakes and a late checkout. Best of all, no waiting in line at the bus stop. Hotel staff held seats for us on the bus, and we just swapped places when it stopped at our doorstep! The trepidation I felt on the hair raising drive up, was not all because of those crazy hairpin bends. This was the trip of a lifetime and I fretted about a possible discrepancy between reality and our overly high expectations. 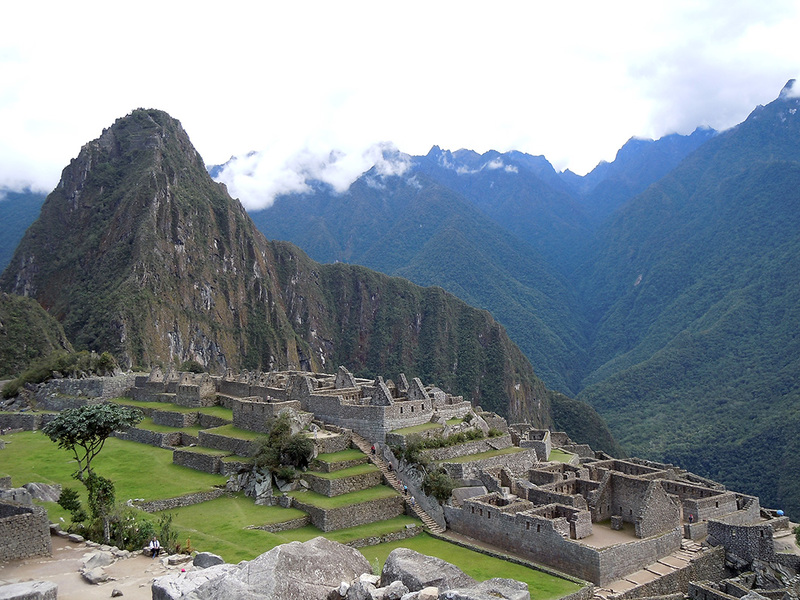 The forecast was cloudy and we weren’t climbing Huyana Picchu. A 1000 feet high sheer cliff with narrow, uneven steps and no protective railing…I am not quite that adventurous and R has issues with altitude. So with no reason for an unearthly wake up call, we timed our arrival for 7AM. It was still chilly and the sun, indecisive, as we walked down the path from the nondescript entrance. And there it was! The Lost City! 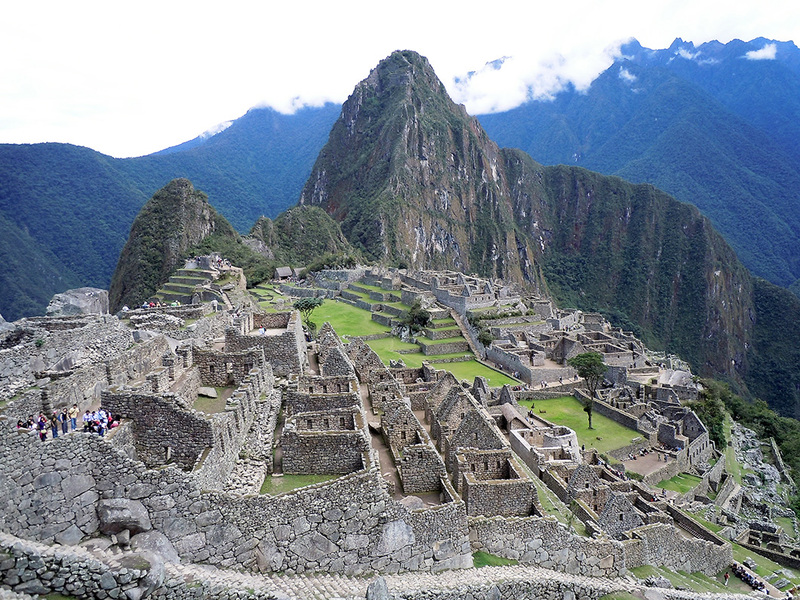 The mother of all world heritage sites….the remarkable architectural feat of the Inca that was built and abandoned in a matter of a hundred years for reasons unknown. And it was every bit as impressive as I had imagined. Even more so, if that were possible! No words or pictures can do it justice. 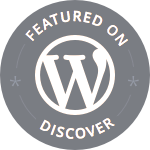 Granted this doesn’t match the landmarks of other ancient civilizations in antiquity or architectural complexity. But that setting! Nestled between soaring, jungle clad mountains with the rio Urubamba hugging the base and those unbelievable stone terraces spilling over the edge. How could anyone be underwhelmed by this extraordinary, almost spiritual merging of architecture and nature? 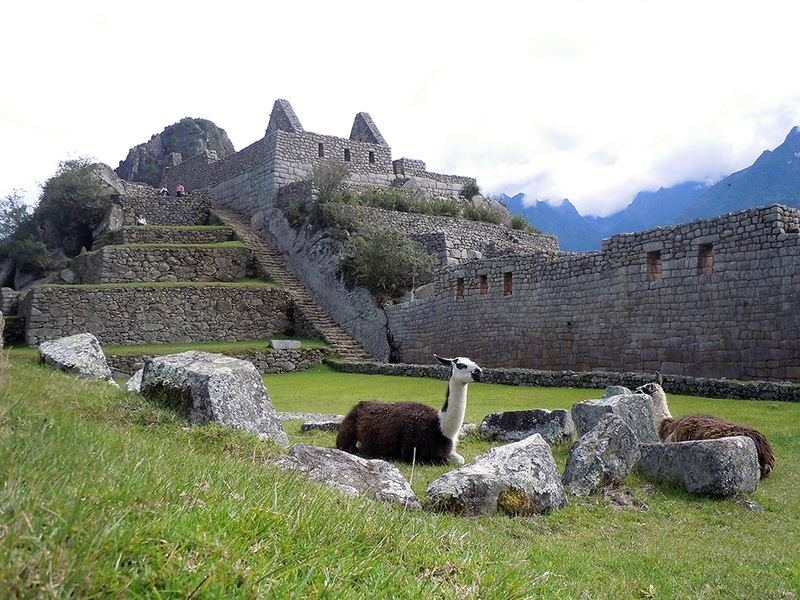 There is speculation that Machu Picchu (Quechua Machu for ‘old’, and Picchu for ‘top’, meaning “Old Peak”) might have been a private palace for Pachacutec Inca Yupanqui, the ninth and greatest Inca emperor (1438-1470). However some of its finest buildings and the main ceremonial gateway to the city testify that it was (also?) 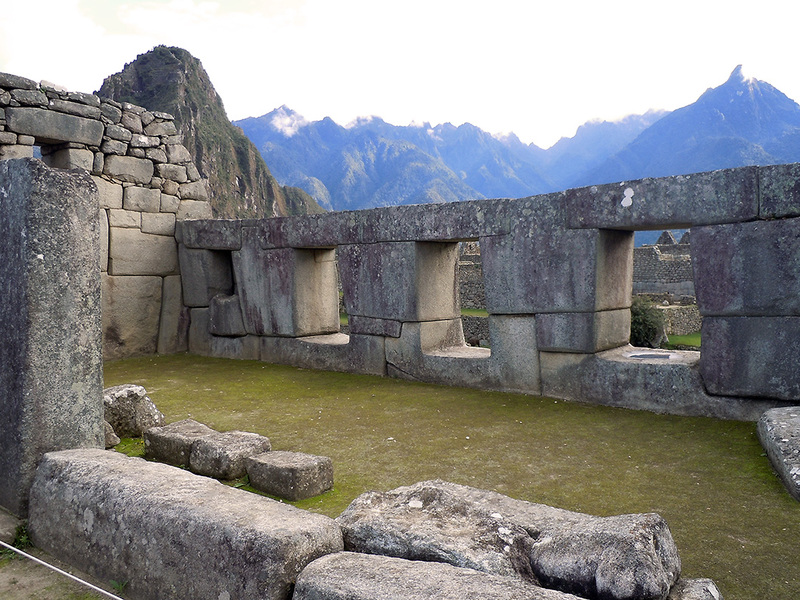 a place of worship to the Sun God, a sanctuary to the greatest deity in the Inca pantheon. Thus making it plausible that this sanctuary might have been abandoned in the 16th century to avoid any likelihood of leading the conquistadors to it. And it remained a ‘lost city’ until its (re?) discovery by professor Hiram Bingham in 1911. Bingham carted away many treasures from the site that are now the source of a protracted legal tussle between the Peruvian government and Yale University. 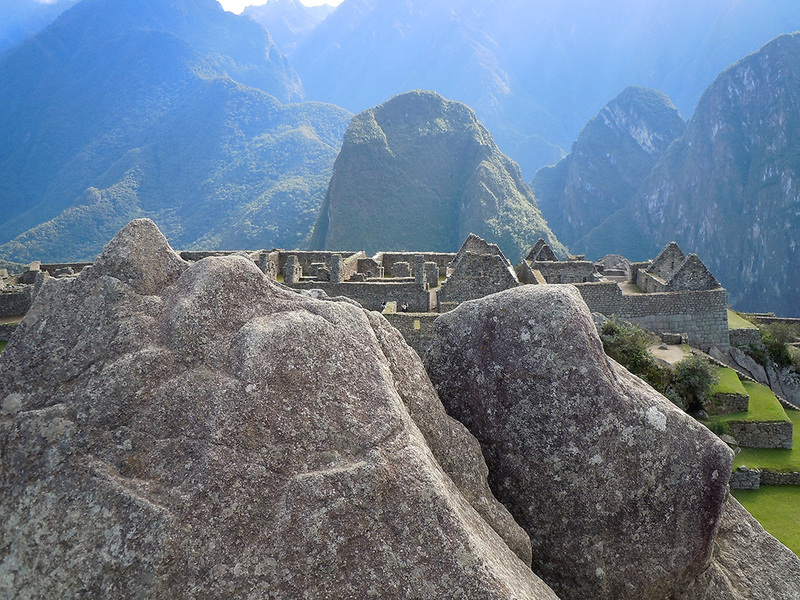 The Intihuatana – also referred to as the hitching post of the sun – all to ourselves! By the time the coach loads of day-trippers started pouring in, our guided tour was done and we were ready for our hour long trek to the Sun Gate or Intipunku: the ceremonial entrance to the city. 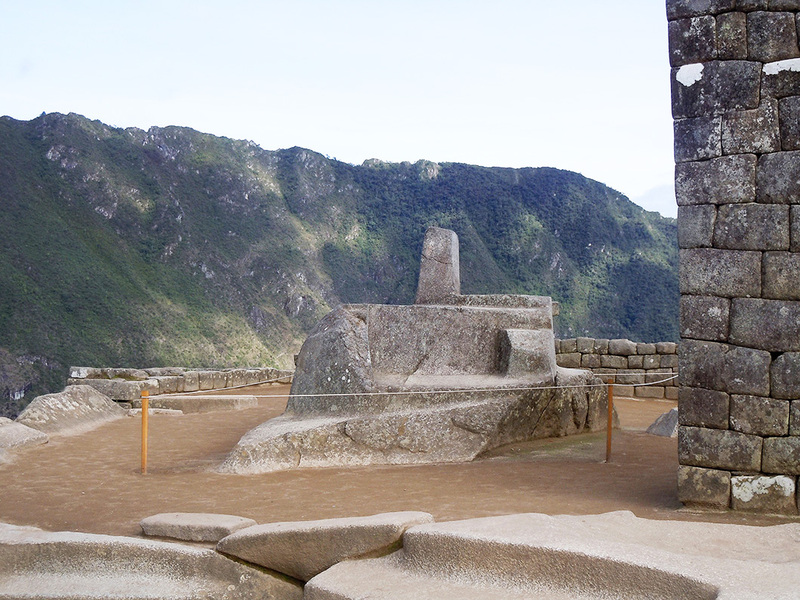 This is the culmination point of the 4 day Inca trek, and from here trekkers get their first glimpse of the sanctuary and that amazing landscape. Gloomy had turned ominous by the time we returned some two hours later, and we hadn’t brought any rain gear. Silly, I know. And not the right sunblock either! Have you ever heard of an Indian getting sunburnt? You have now. I spent hours camouflaging my peeling, blackened nose for nearly six months after! Not pretty. A slight drizzle chased us out, after a few quick shots of the classic postcard view. Outside, I just HAD to get the mandatory stamp on my passport! 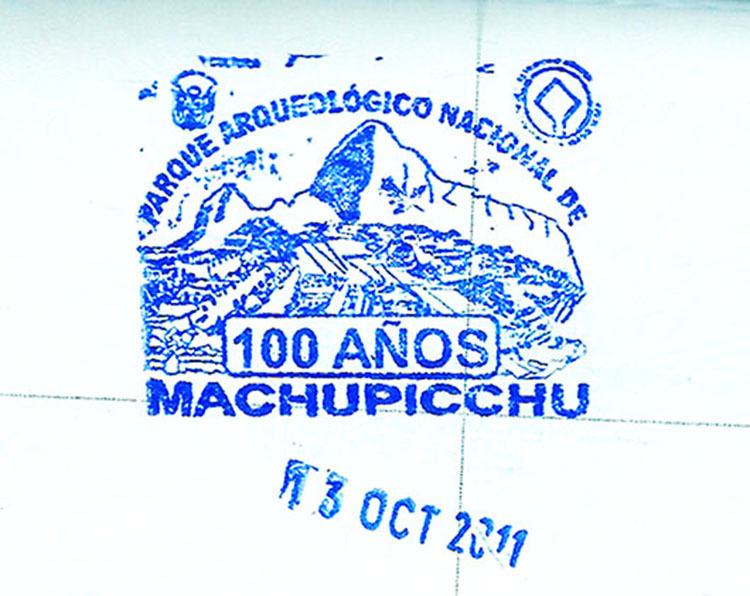 A special centenary stamp this year. We had just ordered – a rather expensive – coffee and pastry at the cafe outside while waiting out the long lines for the bus drive down, when the sun decided it had played hooky long enough. R looked at me and knew I was going back in for another shot. “What if it rains by the time we get there?” he asked hopefully. It did. 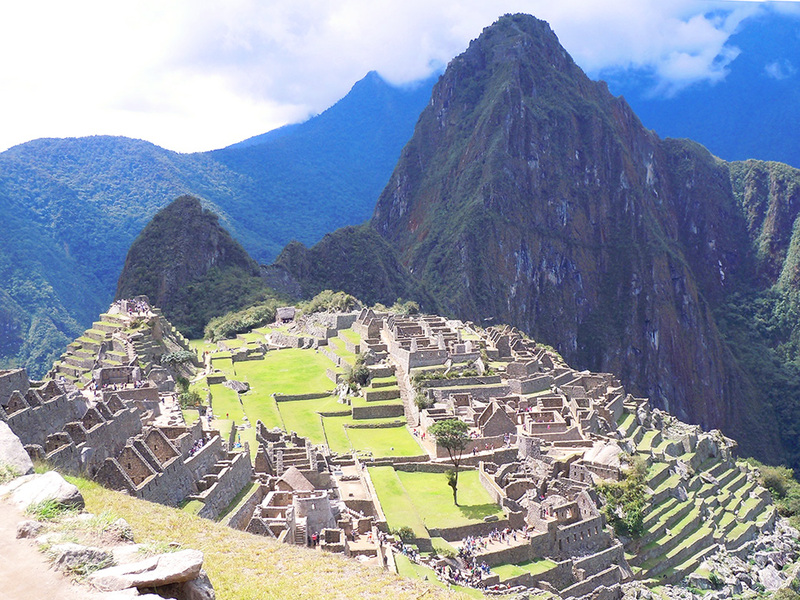 And that steep climb back in was worth the effort for one last sun drenched shot of Machu Picchu. It wasn’t until two days later that our luck ran out. Freak ash clouds from Chile affected flights to Buenos Aires. We were stranded in Lima, and missed our connection to El Calafate. Racing to the airport hotel at midnight in the hope of finding a room after getting our exit stamps annulled, I stuck my hands in my jacket pocket and felt the crackle of dried coca leaves. what an adventure! i would love to have the opportunity to go there. i was wondering if you ‘felt’ anything there? peace, calm, death, spirits? Absolutely beautiful, and what an impressive civilization it was in its time. I like that you admit your limits as an adventurer. Your photos represent your points well. You provide the armchair traveler information about the place. But like Paula above comments, I would like to know your feelings, reactions, and observations of it as a holy place.